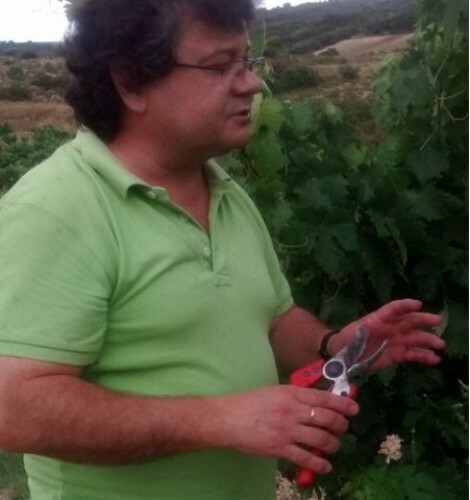 After graduating with a master in Enology and Agriculture from University of Salamanca, Angel Escudero of Rioja began some years of travelling to gain experience and to expand his horizons. Araceli Sanchis of Valencia graduated with a degree in Enology and also decided to travel. The two met for the first time in Cameroon-Africa, and soon after decided to get married and throw roots in their native land and to create the best wines ever tasted in the Rioja. In 1995 they bought an old wine cellar in Laguardia – Rioja Alavesa, which they rebuilt strictly respecting the traditions, and here they founded BODEGAS CASA-JUAN. Angels family has lived in Rioja Alta for generations and owns 20 hectares of 50 year old vineyards so the entire harvest of grapes is processed in the Winery of Casa-Juan. Thus it all remains in the hands of the family. Since the beginning, Angel and Araceli managed to maintain their idealism.